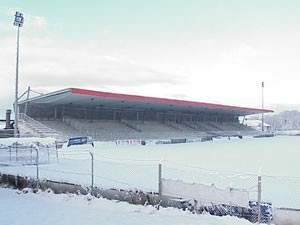 The Showgrounds is a strange hybrid of the modern West Stand and some pleasantly archaic old stands. Good views from all parts of the ground over the action, and views over the Sligo mountains and the town, as the ground is on a hill to the east of the town. The Sligo Rovers Shop is on the corner of Strandhill Road and O?Connell Street. Run by ex-player and now commercial director Nicky Broujos (he's an American who emigrated to Ireland!!) sells replicas, hats scarves and all sorts. If you are a registered user then you can login, and create your own personal review of Sligo Rovers Football Club - The Showgrounds. These reviews can be private or public.